When I get to spend time with my Mamita, I question whether nature or nurture is responsible for her stubborn streak I see reflected in myself. I’m still waiting to get my results back from 23 and Me, but I’m willing to bet there’s some sort of gene responsible for my bullheaded tendencies. I can remember as a youngster, I didn’t want to learn any one else’s lessons; I wanted to learn my own. I’m proud to report that, believe it or not, I’ve grown up a little and I am now willing to let someone else do the learning for me. Watch out world, I’m an adult! There are two stories I’d like to share with you not only as proof, but because maybe someone else out there is also mature enough to learn through the mistakes of strangers. The first story is one that Craig and I witnessed first hand. 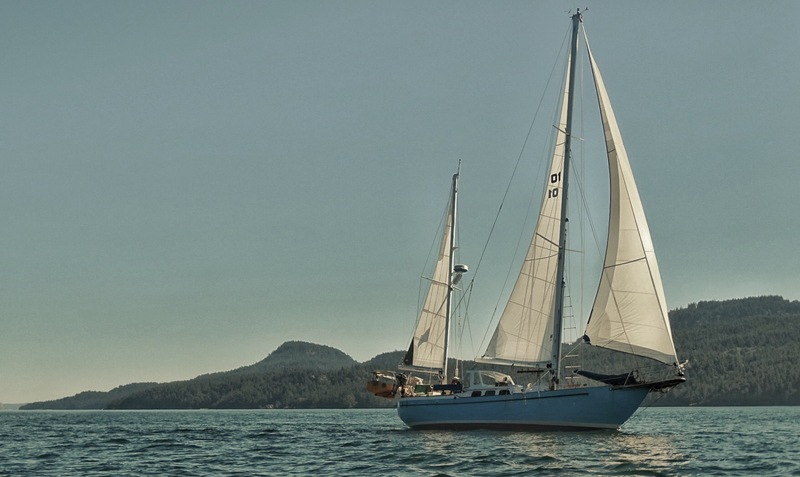 While we were anchored in La Cruz, a voice came over the radio, “Attention the fleet! Does anyone have contact info for Hungry Hippo*? They are not aboard and their boat has broken free and is getting blown through the anchorage. They’ve already hit one boat and are heading toward the reef.” That got out attention! There was a rapid coordination of effort from folks within the anchorage to launch dinghies, tow the sailboat to safer water, and re-anchor. Luckily there was only minor damage from the collision and no one ended up on the rocks. Zubie’s engine is not strong enough to help, so Craig and I listened to the radio and watched through binoculars as we speculated to the cause. Did a swivel corrode and now they’ve lost their anchor? Did they use insufficient scope? Maybe the rising tide and choppy waves caused the boat to break free of the sea floor, along with any chance of staying put. A couple days later we found out that it was that latter. We chatted with our friend,who was in the rescue crew, about it focused on the challenges he faced in that role. Other than learning to anchor with plenty of rode out, there are some other lessons in here. What if something else happens and your boat is floating away while you’re happily ashore drinking margaritas? Can a stranger come on board and figure out how to start the engine, weigh anchor, and reset the anchor? We decided it would be smart to leave our contact info along with some sort of note with instructions in the cockpit (or somewhere obvious). The family who experienced the next story was incredibly lucky that no one was injured and that their mast stayed up. I consider myself lucky that one of them was willing to share with me so I could try to avoid the entire thing all together. Isla Isabel, that island with all of the blue footed boobies, has a rocky sea floor. The anchorage is infamous for trapping and claiming anchors. If an anchor gets wedged tight enough, there’s not much you can do other than cut it loose and buy a new one. This boat, we’ll call them Clover, was weighing anchor to leave Isla Isabel when the chain went taught. Suspecting that the chain was wrapped or the anchor was stuck in some rocks, they sent someone down with snorkel gear to see if they could un-stick it. As the snorkeler returned to the surface near the bow to report that the chain was indeed wrapped around some large rocks, a significant swell lifted the bow. It rapidly rose and fell, directly on top of the snorkeler. He had a bad headache, but that was the least of the damage. When the bow rose, the taut chain had no stretch or allowance left; it stayed rigid and the boat bent around it. The damage to the boat included: a bent jib foil, the bow roller ripped off the coaming, and a severely bent bow pulpit. Perhaps most concerning was the jib foil. Within the foil is the headstay which is partially responsible for holding up the mast. I don’t know all the details of their rig and their mast, but I’m probably not being too dramatic by saying that something like that could take down someone’s mast. Since we heard this story, Craig and I have returned to Isla Isabel. We had a serious conversation about what to do when raising the anchor if it seemed like the chain was getting too tight. We agreed with Clover that if it feels tight, immediately let more chain back out. Remove the tension so that the boat is able to move with the swell without stressing the whole system. So there you have it. You learn something, or a few things, new every day! *Boat names have been changed to protect the innocent, just like in all the best shows. “Lessons Learned” could and should be a wholly separate blog subject – maybe a good kickstarter for when writer’s block sets in. At any rate, it’s certainly helpful for your many sailing friends and much appreciated. Sent from Whites Cove on Catalina, my pitiful excuse for exotic cruising this year. dear kraigle ~ …and mother nature’s traits include strength and unpredictability!